The godfather of the indie stompbox boom keeps the good times rolling with a Brit-voiced distortion and a two-in-one overdrive/compressor… Richard Purvis says let there be rock. We hope Robert Keeley’s remembering to eat, sleep and go to the toilet. 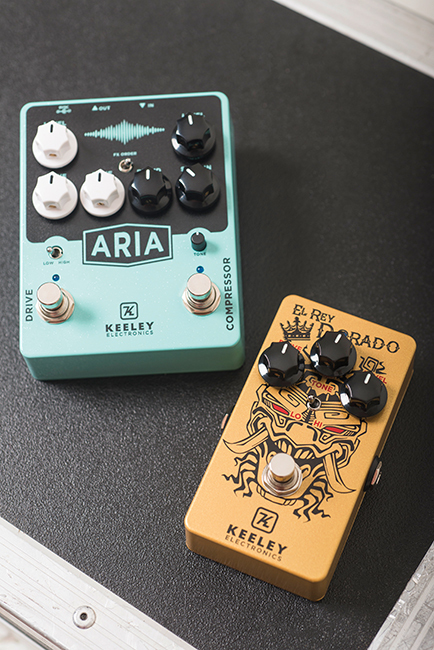 It can’t be easy to make time for the boring but essential stuff when you’re seemingly spending every waking moment transforming your boutique pedal business into a global empire, and this summer saw the emergence of yet another two contenders from Keeley’s busy Oklahoma workshop. 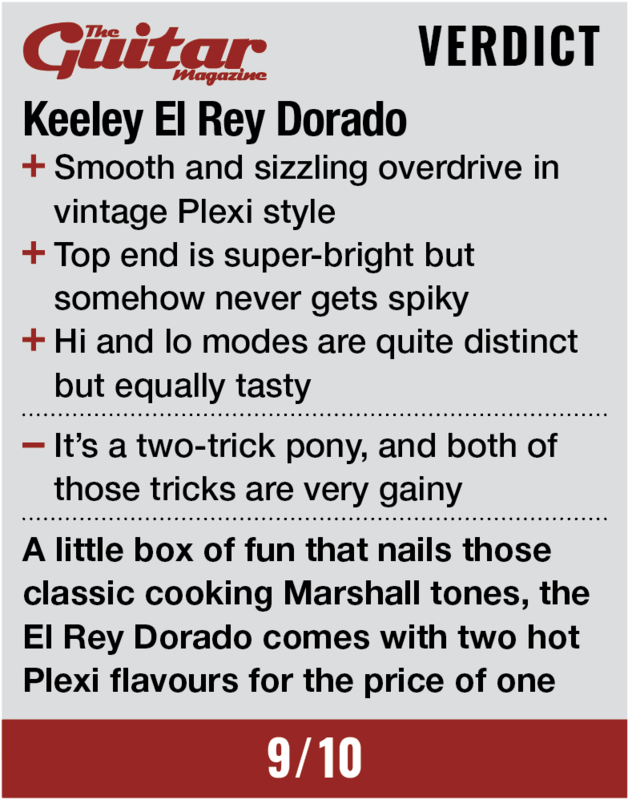 First up is the El Rey Dorado, which started out as a hand-built limited edition but has now gone into full production. ‘El Rey Dorado’ translates as ‘The Golden King’, and the royalty we’re talking about here is the famous black and gold livery of a Marshall amp. Put simply, it’s a Plexi simulator. Of course, the term ‘Plexi’ isn’t always clear – it’s become a catch-all term for any Marshall that’s old enough to have been assembled by someone wearing flares. But the definitive Plexi is the 100-watt Super Lead made famous by Hendrix, Clapton and Townshend in the late 60s: a hugely important amplifier if only because it brought new levels of loudness to rock music. That’s the El Rey Dorado’s target tone in ‘hi’ mode, while ‘lo’ is meant to sound more like the relatively civilised JTM45. Other than the mode switch you just get controls for drive, tone and level. They’re a tad cramped, but this pedal feels every bit as solidly built as the amps that inspired it. 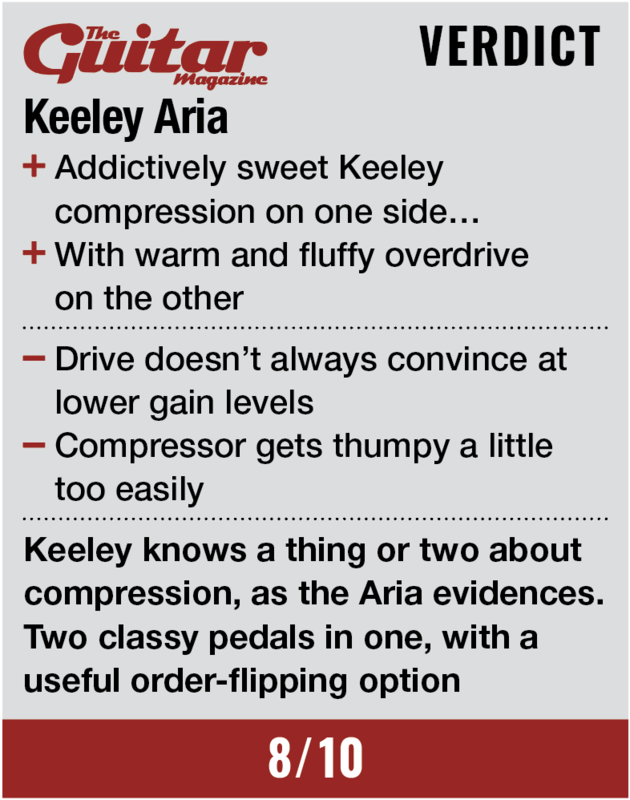 Compression is where Keeley started out, so there’s some serious pedigree in the Aria. In fact the right-hand side of this mains-only unit looks very much like a rejigged clone of the Keeley Compressor Plus, with the same four knobs and only the switch for fast/slow release time missing. And it isn’t really missing, just being shy: you’ll find it in titchy form mounted to the bottom of the circuit board. If the control layout on the left side also looks familiar, that’s because it’s based on Keeley’s Red Dirt: a valve-like overdrive with FET input stage and switchable hi/lo gain modes. But two more features make this more than just a pair of pedals shacked up in the same box: a toggle switch in the middle lets you flip the order of the two effects, as with the D&M Drive; and if you have a couple of splittable TRS cables going spare, you can even (once you’ve flicked four dip-switches on the PCB) place other pedals between the compressor and the overdrive in your signal chain. We begin with a Tele, a clean-ish tweed amp and the El Rey Dorado’s gain set conservatively low… and our first thought is that they must have wired that drive control back to front, because there’s nothing remotely conservative about the noise that comes out of this little thing. It’s gleefully ferocious, like a vintage Marshall with the bright channel cranked somewhere close to full blast – and yes, this is on the ‘lo’ setting. Are we complaining, though? Not a bit. This sound is all about smooth harmonic saturation, with a shamelessly fizzy top end that refuses to be pushed into harshness, and it’s a joy to mess around with. From sweetly compressed chords and speedy lead work on the bridge pickup to bluesy runs with that uniquely British metallic clarity in the neck position, it never sounds anything less than entirely convincing. Switching to ‘hi’ brings a leap in level but the tone actually feels less saturated, with more midrange bite and a fuller low-end response. It really is, in a way, like changing to a higher-output amp. The character of the distortion is essentially the same as in ‘lo’ mode, but this is a more tight and strident version, and that’s a great option to have at hand. In truth, the El Rey Dorado isn’t the most versatile stompbox that will ever grace your board – the tonal variety is almost as limited as the gain range – but that switch adds just enough complexity to keep it addictive beyond the first pigeon-scattering blast. In high-gain mode, the overdrive side of the Aria doesn’t actually sound all that different to the other pedal – you could see it as a more sensible cousin, with tidier hair and much better school reports. The drive shares some of the same Marshall-like smoothness and squishing-out of midrange spikes, but the low end is more rounded and the treble much less pronounced. Used on its own, the compressor has the same flattering effect we’ve come to expect from Keeley’s well-respected pedals of the type. You do have to keep the sustain control down low to avoid unnatural popping effects on the transients, which is a shame; but when used tastefully – with at least a dash of untreated signal blended in – this side of the Aria does a great job of making everything sound that little bit bigger and crisper, while keeping your playing dynamics nicely contained. The two effects are most definitely a complementary pair, and changing the order of the circuit has a subtle but significant effect on the ‘size’ of the resulting sound: broadly speaking, compression into drive means more distortion, and drive into compression means more clarity, though that’s very much dependent on settings. And while the Aria isn’t as immediately seductive as the El Rey Dorado, between seven knobs and two toggle switches there are plenty of variables to explore.